I really enjoy this kind of book. From Kidder's The Soul of a New Machine to Zachary's Show Stopper! (with a healthy dose of video game stuff like Montfort and Bogost's Racing the Beam thrown in for good measure), I'll almost always going to pick up a book that tells the inside stories and battles of the tech products I love (and the industry which makes them). Unfortunately, this book doesn't reach the heights of the genre. This has left me confused since it seems to have all of the major pieces to be a classic piece of tech history. 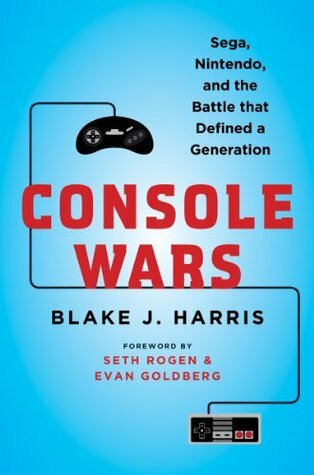 As I've been reflecting on it, I think I've figured out why: to steal the metaphor from this book's title, the console war of the late-80s to mid-90s was fought on two fronts (Japan and the United States) across multiple arenas (with product development and marketing being the most notable). But, Console Wars only really describes the marketing battles in the US. I'm sure that's a much easier story to write. The author is American, after all, so I'm sure it was much easier to talk to the Americans from the story. Since most of the product development was actually happening in Japan, American marketing was really all that was left. But I'm more of a product guy. Yeah, marketing is important and I remember the commercials and I certainly picked sides back in the day (Big-N all the way! Play it loud! ), but I really want to know the stories of the products that I spent so many of hours of my youth with. Who figured out Mode 7 and how'd they choose the chips for it? How many hours did Team Sonic spend agonizing over the exact speed of our favorite hedgehog? Most importantly, though, are the questions "How did the 32X happen?" and "How did the Saturn happen?". From the perspective of the Americans in the book, these decisions were just handed down by fiat with no explanation. But for decisions that were almost company-killers (and ultimately decided the console war that the book is describing), that's unsatisfying. By not providing Sega of Japan's side of the story, it makes them seem cartoonishly incompetent; and I don't think that's fair. They were undoubtedly working against a set of constraints and making the best decisions they could with limited information. But without actually knowing those constraints or that information, we're left with a big gaping hole in the story that can, at best, be filled with wispy insinuations. Without the Japanese side of the story, this book provides an ultimately superficial look at the great console war. It's entertaining to see at least part of the inside story of such a major part of my childhood but it left me largely unsatisfied. Sign into Goodreads to see if any of your friends have read Console Wars.